Did you know that more than half of all U.S. businesses are either based out of or started in a home? This book is for all of you who want to know where to begin in your quest for starting your own business. This book will guide you through the steps, for not only finding your niche, but tips for becoming self-employed. Each business listed may have numerous specialties to choose from or there will be enough information to come up with a new idea of your own. Most of these businesses can be started with a very small investment working part or full time. Many entrepreneurs started multimillion-dollar businesses in their garage or on a kitchen table. Reader S. Fox says, "This book shows the artistic person how to make money doing what they love, as in designing jewelry, woodworking, etc. For the animal lover, selling eggs, raising chickens, pet sitting, dog walking and grooming might be your bag. You have a list of supplies you will need to get started and an estimate of how much money you might make. "In the computer world, this book has many at-home jobs, saving babysitting, clothing and transportation expenses. The author has actually experienced many of the jobs she writes about, so you are getting first-hand information in this book. 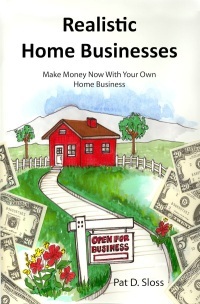 I would recommend this book to anyone that wants to work from home, out of the home, add a part-time income or become an entrepreneur." You may have forgotten or buried some of your passions while you were too busy looking for any job that would pay the bills. We may not acknowledge all of our abilities until we think about all we have accomplished. List all your past jobs and hobbies and the skills it took to accomplish each one. You may be surprised to see how many there actually are on your list. Now list your passions. These passions might be things you may have left behind years ago or interests you still have. List anything like music, crafts, causes, or artistic endeavors ... anything you have or had a passion to try. Pick the top five skills and mark your five most important passions. Everyone is different but you should get some idea of what you would like to do with your passions and what are your best skills. Do your top skills and passions spark any long forgotten ideas? It is OK if no ideas come to mind yet. We have more work to do to decide on a direction or number of directions where your interests lie. Even though you may already have a particular type of business in mind, these lists may help you drill down on the subjects and help you find a niche you have not thought of before. Narrow your search by selecting your preferences on the following list of different kinds of work. You may be restricted physically or your personality may dictate some kinds of work that you may be better at than others. Select your preferences from the following list.